Hand polished to a mirror shine, Anatometal's surface finish is recognized as one of the best in the industry. Screw-on ball rings have the comfort and look of a captive bead rings without the need for opening pliers. The ball screws on to the ring and there is a considerable gap between the ball and the other side of the ring. The screw on ball ring is not appropriate for all piercings, especially 'below the belt' piercings. 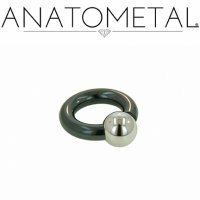 This Niobium Screw on Ball Ring comes with a steel ball. Inner Diameters: 3/8", 7/16", 1/2", 9/16", 5/8", 11/16", 3/4", 13/16", 7/8", 15/16" and 1".